It is undeniable that 10 Gigabit Ethernet (10GbE) has become a commonplace for current network backbones, data centers, and server farms to support high-bandwidth, mission-critical applications. And with the continuous advancement and improvement in 10GbE technology, its influence and reach have extended to midmarket networks, for the purpose of ensuring faster data transmission and better network performance. Then, how to achieve an efficient and smooth 10GbE deployment? Let’s start from the most basic element: the connectivity solution for 10 GbE. Unlike in the past, nowadays the evolvement and maturation of Ethernet technology already made 10 GbE an desirable and much affordable choice with higher performance at lower costs. And there exists a distinct need for 10 GbE in network communication. The ever-increasing applications require considerable bandwidth to support the transfer and streaming of large data, video and audio files. Besides, since the network technologies develops rapidly and dramatically, companies must concern about their current infrastructure’s ability to keep pace. Moreover, re-cabling a network can be money consuming, thus organizations should take precautions to ensure their cabling systems can perform well in the long run. 10 GbE generally contains various advantages that would cater for the never-ending requirement of the service providers. Firstly, 10 GbE provides the very best assurance for being able to support forthcoming technologies and delivers utmost investment protection. And 10 GbE is an ideal technology to move large amounts of data quickly. The bandwidth it provides in conjunction with server consolidation is highly advantageous for Web caching, real-time application response, parallel processing and storage. Besides, 10GbE campus backbone establishment is a one-time expense that can provide significant cost savings when compared to monthly communications link bills. Since you have decided to implement 10GbE technology, the next step is to consider the data carrying techniques that facilitate such bandwidth. Copper and fiber cabling serve as the prominent method for data transmission, and each of them has their own advantages and drawbacks. Fiber optic cable is often employed in remote campus connectivity, crowded wiring closets, long-distance communications and environments that need protection from interference, such as manufacturing areas. Since it is very reliable and less susceptible to attenuation, it is optimum for sending data beyond 100 meters. However, fiber is also more costly and its use is typically limited to those applications that demand it. The following diagram summarize the standard fiber cables applicable to 10 Gigabit Ethernet. Copper serves as the standard for transmitting data between devices due to its low cost, east installation and flexibility. However, the working distance of copper is limited in short length, typically 100 meters or less. Besides, bundling copper cabling would result in interference, thus make it difficult to employ as a comprehensive backbone. Therefore, copper cabling is often used in communication among PCs and LANs. The following diagram provides copper cabling options for 10 Gigabit Ethernet. In addition to the cabling choice, service providers should also pay attention to the devices that connect their cabling to their network. Transceivers provide the interface between the equipment sending and receiving data and the cabling transporting it. 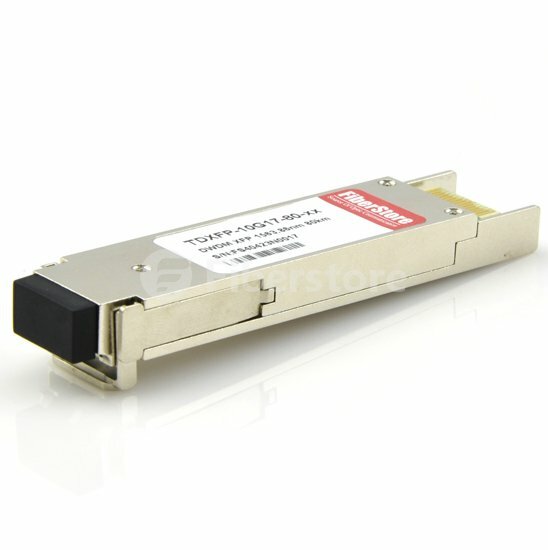 There are various transceivers available to match each gigabit standard. XENPAK—the first 10GbE pluggable transceivers on the market to support the 802.3ae standard transmission optics. They are large, bulky and used mainly in LAN switches. These transceivers are “hot pluggable” and support the new 802.3ak copper standard with vendors now producing transceivers to connect CX4 cables. X2—the smaller brother of the XENPAK pluggable transceivers, the X2 form factor is about 2/3 the size of the XENPAK. With the same “hot pluggable” specifications and supporting all the 10GbE standards (including copper), the X2 form factor allows for more port density on switches. X2 provides customers with a strong sense of assurance that this technology is the best choice for today and will have strong vendor support. XFP—the newest pluggable transceiver on the market, XFP is the closest in size to the SFP pluggable transceiver now used for gigabit technology. The XFP form factor will allow switch vendors to increase port density in a smaller area for cost savings. SFP+ —SFP+ transceiver is designed on the consideration to increase the capacity of the existing SFP. For many customers, the possibility of achieving 10G speeds and a mechanical form factor that allows 1G or 10G to reside in the same footprint, might prove attractive. 10 Gigabit Ethernet is becoming the prevalent technology which is used to upgrade networks and support bandwidth-intensive applications. Companies and organizations should have a solid and comprehensive understanding of 10GbE technology before deploying it. Which would help to develop a sound migration and cabling method and surely benefit from 10 Gigabit Ethernet in the long run. This entry was posted in Uncategorized and tagged 10GbE cabling method, 10GbE transceiver module, Copper Cabling, SFP+, X2, XENPACK, XFP on July 16, 2016 by Aria Zhu.